On April 20 the Family Support Center of South Sound celebrated the launching of Washington State’s first Camp HOPE at the Governor’s Mansion with community members, elected officials, and advocates for children and youth in the South Sound community. Camp HOPE is an evidence based camping and mentoring program for children and youth who have witnessed domestic violence and experienced trauma and the Family Support Center was selected to develop Washington’s first program. Camp HOPE Washington is affiliated with Camp HOPE America, which launched the first Camp HOPE in San Diego, California in 2003. By the end of summer 2017 there will be FamiCamp HOPE programs in 12 states across the country, including Oregon, Oklahoma, and California. 60 children and youth will be served in the two camp sessions, one for ages 7 to 11 and another for those 12 to 17. Camp HOPE will take place at Panhandle Lake 4H Camp in Shelton where campers will sleep in open air cabins, canoe, swim on the private lake, and participate in “Challenge by Choice” activities such as the low ropes course, which will support campers in building relationships and trust with children and youth of shared experiences. Campers will be challenged to try new things, while being praised and affirmed for who they are, and who they are becoming. Each day ends with a campfire where they reflect on the day and identify where they saw hope in their peers. Sally, 9-year-old daughter of Olympia’s Sarah – name has been changed for privacy – would like to be a camper at this year’s inaugural Camp HOPE Washington. Sarah, 42, has an active court case against the father of her children and is getting help from the Family Justice Center program at the Family Support Center of South Sound. Sarah’s former partner had the family constantly walking on eggshells wondering when he would lash out. Their financial situation was unstable, made worse by his economic abuse. Sarah describes herself being more passive as his control increased. As his behavior became more frightening, she found the courage to leave the relationship with the support of the Family Support Center. Sarah describes her four children as “amazing,” and Sally especially lights up at the idea of going to a summer camp. Like most children, she looks forward to making friends and exploring nature. Sally has never been to a summer camp before, and is thrilled about the possibility. “I would like to run around in the grass. And eat s’mores,” Sally has told Sarah. According to the Adverse Childhood Experiences study, witnessing domestic violence is one of the most harmful adverse childhood experiences for a child, having a direct effect on their long-term health outcomes. The best way to mitigate the negative impacts of trauma and domestic violence is to provide opportunities for children and youth to build hope and resilience. 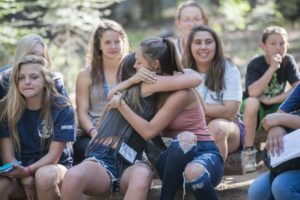 Recent research, compiled by University of Oklahoma Tulsa and Camp HOPE America finds that the camping and mentoring experience at Camp HOPE increases hope in children who attend. Hope is the single best predictor of wellbeing across the lifespan, and is directly linked to a person’s ability to thrive in the face of adversity. Camp HOPE Washington will be free of charge to campers and their families. The Camp HOPE fundraising campaign was kicked off with an award from the Verizon Foundation in the amount of $15,000. Additional individual and corporate sponsorships are needed. The estimated cost per camper to attend one week of camp is $600. The Family Support Center of South Sound, founded in 1992, is a non-profit 501(c)3 agency providing a variety of services in one location to families with children and survivors of domestic violence, sexual assault, stalking, and human trafficking with one mission: “Working Together to Strengthen All Families.” Core services include a Family Justice Center program, Pear Blossom Place family shelter & affordable housing, parent & child education, family resource services, and more. To learn more, visit Camp HOPE Washington’s website. Visit The Family Support Center’s website or call 360-754-9297. For stories of children and counselors elsewhere who have attended Camp HOPE in other states, visit Camp HOPE America’s website.